TEMP-3000 manufactures specialised armour protection equipment for military-based applications. The company is the official supplier of products for the Armed Forces of Ukraine. In 1999, TEMP-3000 mastered the production of hard armour plates according to the Ukrainian standard sixth class of protection, made of silicon carbide (SiC). In the same year, for the first time in Ukraine, TEMP-3000 manufactured bulletproof vests of the sixth class with plates of its own production for the Alpha division of the Security Service of Ukraine. In 2002, the company developed the technical specifications and manufactured body armour of Corsair M3 bulletproof vest. This was developed for the units and divisions of the Armed Forces of Ukraine, participating in the peace-support mission in Iraq. In 2004, TEMP-3000 released 15,000 body armours and 5,000 helmets per month without production and technological failures. To further ensure the provision of the Armed Forces of Ukraine fighting units, the company has increased its monthly production of bulletproof vests and helmets and is constantly working on new models of bulletproof vests and protective helmets. TEMP-3000 is engaged in the development and design of new models of helmets, which, in close cooperation with the factory for forming composite hard armour plates, creates new models. This process begins with a computer model and creation of plastic helmet models using five-axis milling machines on its basis, and ends with production of matrices and male die parts for the direct moulding of helmets. Creation of a modern helmet is impossible without a pre-preg production line. This equipment allows the polymer thermosetting binder to be uniformly applied to the fabric. Furthermore, pre-pregs are used for the formation of helmets. On the same prepreg production line, it is possible to apply a breathable waterproof membrane to the fabric. The recent high-temperature sintering of ceramic hard armour plates allows the production of hard armour plates of the sixth class of protection according to the standard of Ukraine or IV level according to the standard NIJ 0101.06 USA of the most popular ceramics, namely B2C4 (boron carbide), SiC (silicon carbide) and Al2O3 (aluminium oxide). All hard armour plates undergo X-ray television control. TEMP-3000 has participated in the production of products developed in the USSR, and afterwards it began developing its own design documentation and technical specifications for ballistic helmets and bulletproof vests, simultaneously setting up production under its own brand. The production of ballistic fabrics from Kevlar and Twaron filaments was launched at the company’s own facilities for the first time in 1996 in Ukraine, along with the first composite helmet made of para-aramid fabric. The formation of continuous synthetic filaments is performed with the help of Germany-based Barmag’s production line. The manufacture of blended yarn based on cotton, linen and polyester fibres takes place at the spinning mill. There is also produced a non-combustible yarn made of meta-aramid fibres called Conex. The design department for the development and design of garments and body armour is operated in direct interaction with the sewing production. Employees of this division work in the computer-aided design (CAD) system, which allows speeding up the process of designing and making changes to project documentation. The department of camouflage fabrics computer development includes equipment with the ability to print a picture directly on the fabric. Advantages are the accelerated development of the fabric print and the accelerated selection of its colour scale. Quality control at the company is carried out in a certified for technical competence laboratory for fibres, filaments, yarns and textile materials control, where acceptance control of fibre, yarn and filaments, component materials and fabrics is performed. Components and finished products testing for fragmentation resistance in accordance with Nato STANAG 2920 standard is performed by the laboratory, equipped with modern measuring and test climatic equipment. All bulletproof vests and helmets have ISO / IEС 17025: 2006 (ISO / IEС 17025: 2005) certificates. The company introduced the quality management system in accordance with the requirements of ISO 9001: 2009 (ISO 9001: 2008). The company has the licence for production of special individual protection equipment, issued by the Ministry of Internal Affairs of Ukraine. TEMP-3000 began its activity as a specialised enterprise for the production of personal armour protection in 1989. Since then, the company has been producing body armour and ballistic helmets, as well as other armour protection equipment. LAAD Security - Public and Corporate Security International Exhibition - is an international exhibition of technology, equipment and services manufacturers and suppliers for public and corporate security. This brochure provides an overview of the ballistic, armour and tactical military equipment range offered by TEMP-3000. 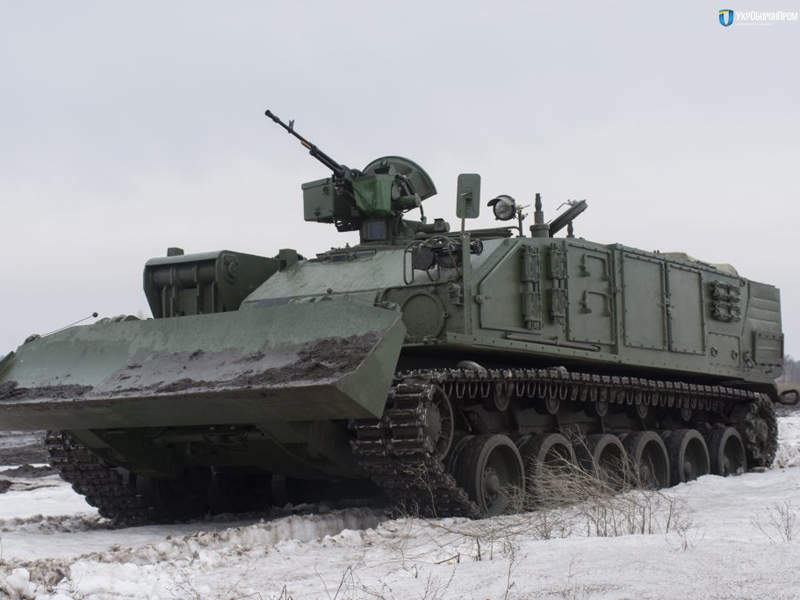 The Atlet (BREM-84) repair and recovery vehicle was developed by Kharkiv Morozov Design Bureau (KMDB).